The total numbers of fires and fire deaths in London are down by over 20 per cent over the last five years new figures reveal. Last year, a total of 36 people died from fire in the capital compared with 47 five years ago. 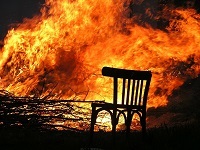 There were 20,770 fires in London last year down by a quarter on 2011/12. Despite the downward five year trend, fire deaths are up on last year's record low of 30 with deaths as a result of deliberate fires, which includes suicide, up to 11 this year compared with three in 2014/15. •	Half of people who died from fire were over 70 years old. •	Two thirds of those who died lived alone, over a third had mental health issues and over a third were in receipt of care. •	There was a delay of 10 minutes or more from the time of the fire starting to the Brigade being called in 45 per cent of fatal fires. •	Over a third of fatal fires were caused by smoking. London Fire Commissioner Ron Dobson said: "The downward trend in fires and fire deaths is a testament to the incredible hard work of our firefighters in carrying out almost 87,000 home fire safety visits last year. "However, last year's increase in the total number of people who died as a result of fire shows that we must never become complacent. "Far too many old and vulnerable people are dying unnecessarily in avoidable fires either because they have mobility issues and may struggle to raise the alarm or their home lacks appropriate fire detection. "In nearly half of fire deaths there was a delay in calling 999 and so that is why sprinklers, telecare and flame retardant bedding is so important. "We're committed to reducing the devastating effects of fire on London's vulnerable and that's why we're increasing funds and stepped up our work with carers and local authorities." As part of the additional savings from last year's budget, the London Fire and Emergency Planning Authority approved a one off investment of £1 million to install crucial fire safety equipment in the homes of London's most vulnerable, to help reduce the number of fires and fire deaths. Initiatives include installing portable water sprinklers, telecare and flame retardant bedding in the homes of those most at risk from fire. Five-year trend figures show accidental fire deaths in the home are down 36 per cent and accidental house fires are down 15 per cent. The Brigade believes this supports the huge amount of fire safety work carried out by firefighters and staff right across the Brigade.